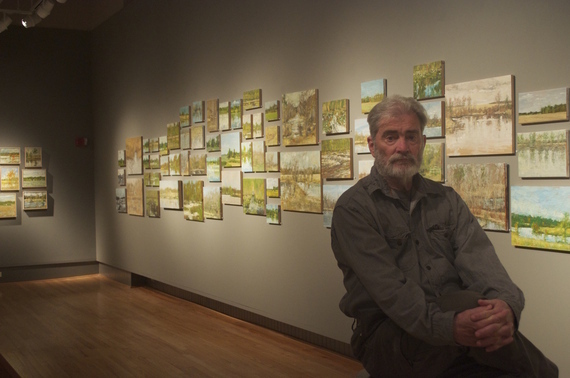 For more than 40 years, artist Raymond Berry has dedicated himself to plein air painting, exploring local landscapes in sequences that record their changes over time. 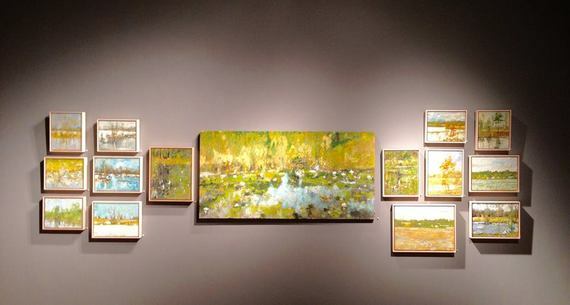 Dedicated to direct observation, Berry sees his study of the land as search for realization that mirrors a "direct experience of our true nature." I recently interviewed Raymond Berry and asked him about this background, his approach, and his ideas. JS: Ray, tell me about growing up in Oakland. As a young adult were you aware of the art of the Bay Area? RB: I would like to say that I started a gang in Oakland -- one that went out into the hills and stayed for days just painting the landscape -- but unfortunately, I left the Oakland area a few months after my birth (my Dad was stationed there/Navy) and came to back to Virginia and lived in Charlottesville until the early '60s. I did come to later have a great deal of reverence for the Bay Area and the Society of Six. I fantasized that I had some of their DNA in me -- Selden Gile died a year after I was born -- and it was appropriate for me to follow in their footsteps working so diligently in the open air. JS: How did you end up at the University of Virginia? RB: It was the natural things to do: the University employed my parents and I grew up running around the school from as early as I can remember. I even went to kindergarten there: The wife of a professor in the biology department ran a little "college" for university progeny and we had graduations every year and wore caps and gowns borrowed from the school. I looked at other schools, but that's where I felt the best. I had a great education there. 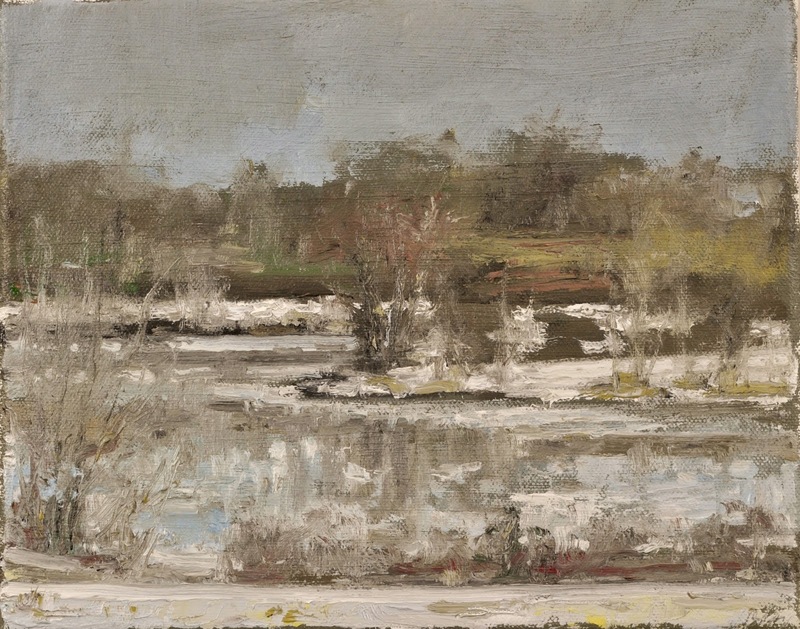 Gilmans, After the Morning Rain, March 26, 2015, Oil on Canvas, 12" x 16"
RB: My time in Greensboro was a revelation and life changing for me. I had gone there on the recommendation of a New York painter, Warren Brandt, who wanted me to work with Peter Agostini, the sculptor. He told me it didn't make any difference that I was a painter; Peter was a great artist and teacher and if he liked me, he could help me. So, I took the chance that I would measure up somehow and enrolled in a class he taught in watercolor. I thought I was pretty good until he set up a little still life and asked everyone to paint the glow and the air around all the objects, not the objects themselves. I started to look really hard and pretty soon I began to see the air and the glow and I worked for three hours straight on that little watercolor. I was never the same afterwards. Luck's, Light Rain, Spring Colors, March 25, 2015, Oil on Canvas, 11" x 14"
JS: How and when did you decide to only paint from direct observation? RB: I'm not really sure it was ever a serious decision, it always seemed so obvious to me. None of my mentors in college or graduate school depended on photography for imagery. My Greensboro mentors, Peter Agostini, Ben Berns and Andrew Martin were such amazing draftsmen that it was considered the only way to fly. If you could draw, you worked mostly from life or memory. If you sucked at drawing, you used photography and your work seemed mechanical and thin. For me, it comes down to learning something new every time I work and working from life allows that. I need to connect directly with my subject. It's also, not boring! I can see using some photographic references for certain details that might be necessary, but I have almost no need for that given my predilection for landscape. I rarely include architecture in my work. If I was a portrait painter, I'd probably be telling you how necessary photography is! 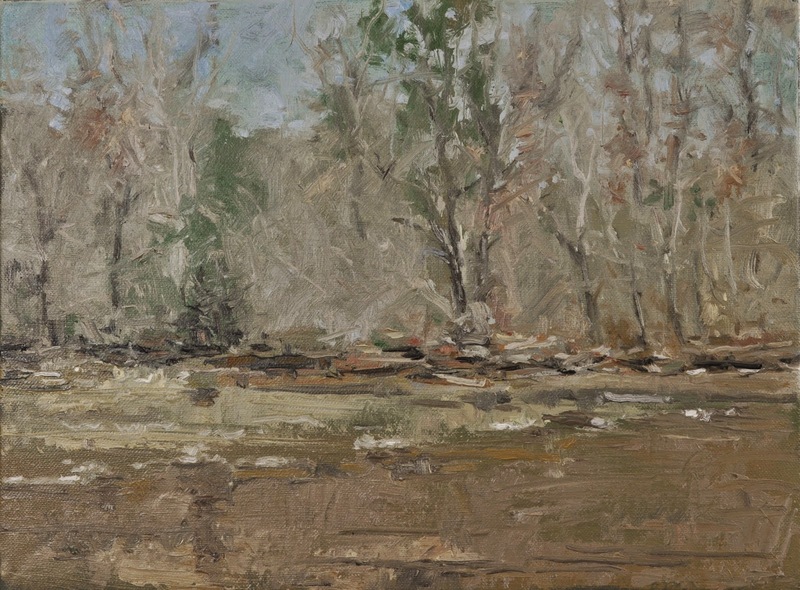 Luck's, Fog and Light Rain, March 14, 2015, Oil on Canvas, 11" x 14"
JS: You are a veteran artist: how has your work changed over time. RB: In the late '60s and early '70s, I did a little of everything. Op Art, Surrealism, Conceptual and of course, Abstract Expressionism. We all loved AbEx! I was good at those things and my work was often clever, successful and mirrored whatever was "in" at the time. I got real tired of changing every few months and depending on how clever I could be. I had been doing landscape problems since I was very young. I tried to draw a creek near my house when I was eleven, using my brand new John Nagy drawing set. I just couldn't get it the way I thought it should be and threw all my drawings away. I'm still trying to figure out water almost sixty years later... I think that my painting has become much more expressive and natural over the years. I'm less worried with formal concerns and more dedicated to painting about an experience. What I may be learning may not fit into a more conventional vision of what's a good landscape painting. I'm more concerned about being respectful to the landscape and the "liturgy" contained within. The Buddhists call this the "teachings of the insentient." Luck's, Rain is Near, March 14, 2015, Oil on Canvas, 6" x 12"
JS: From your long career as an artist: Do you have any favorite stories or anecdotes? RB: As a landscape painter I've had a diamondback rattler crawl slowly over my boots as I was working and once, a huge black bear rumbled by five feet from me (I was just off his favorite path) while I was painting. He could have stopped and told me I was using too much white in my palette: I would have listened. A good story for the history books was one that Agostini told me back in the 1970's: he and Bill de Kooning were drinking together and complaining about how crappy the New York scene was (the usual conversation) and that basically no one that claimed to be a "New York Artist" actually was from New York! Everyone that was showing then was from out of town. This rankled Peter because he really was from the City, born and raised. It struck him that he was the only real NY sculptor and with the next realization that he was thus the tallest New York sculptor (he and Bill were short) and that meant Bill could be the tallest Dutch Abstract Expressionist in New York! They were both very happy with themselves: and taller somehow. 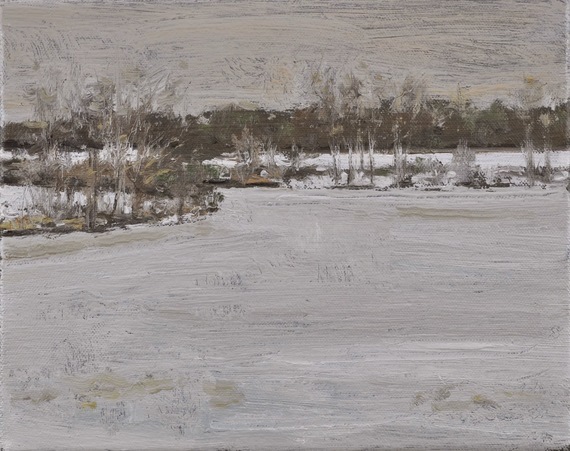 Luck's, Frozen Pond and Dam, February 28, 2015, Oil on Canvas, 8" x 10"
JS: Tell me about your current exhibition, and what you are showing there. RB: It's a body of work that covers about two and half years of painting certain specific sites around Hanover County where I live and where the college resides. The farthest motif is probably fifteen minutes from my office. I can confuse a student and then run out to my truck and be on site in very little time. Most of the work is smallish (in the '80s and '90s I worked big all the time, must have been compensating for something) although there are some pieces on hollow doors: A beautiful size and ratio for landscapes. About half of the work is oil and the other is encaustic. 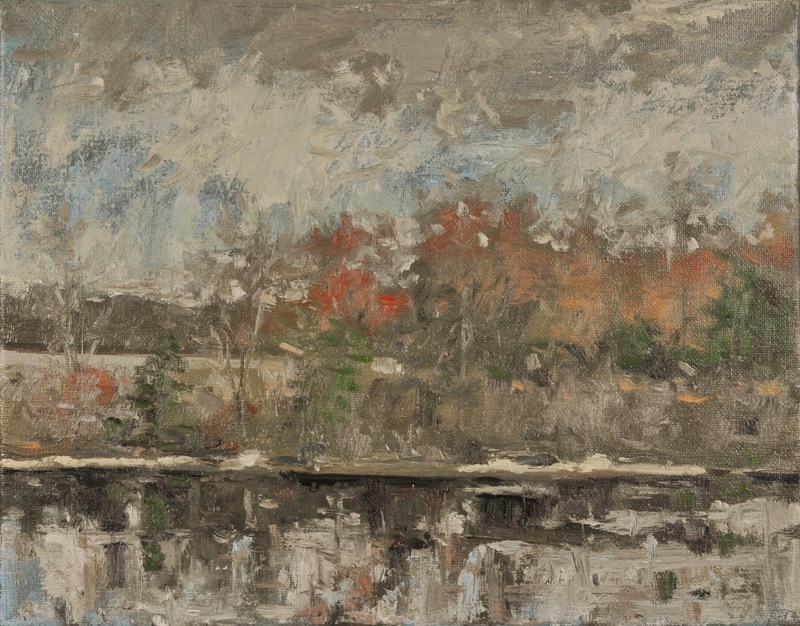 For most viewers, I think the show emphasizes the changes that happen in the land, the variations in temperature and light and the resurgence of growth and reclamation. I am more concerned with more meditative aspects and personal investigations; I think sometimes that my motifs are closer to sutras than sources for imagery. It's that Zen thing rearing its head. 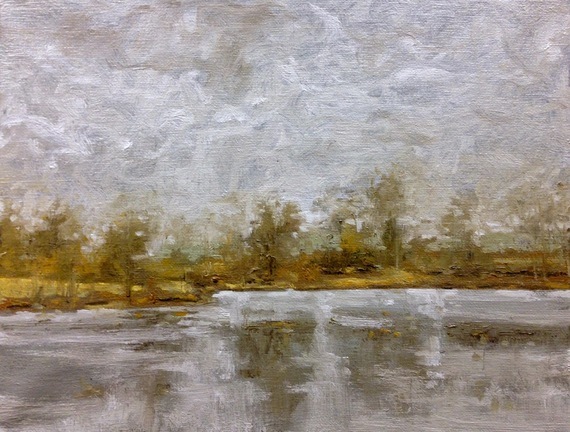 Luck's, Melting Snow, February 22, 2015, Oil on Canvas, 8" x 10"
JS: What wisdom can you pass on to aspiring painters? RB: Be patient and disciplined at what you need to do to actually find your artistic identity. It is distressing to see creative people caught in the trap of trying to be someone else other than who they really are. They mimic others, they borrow others personal alchemy, and they take short cuts rather than earn something with hard work and a personal journey. Never have so many tried so hard to be somebody else! In the beginning we are mostly several influences, that's fine. But soon, discarding the things that are not ours or are holding one back from realization is a necessary task. The other side of the coin is to be open to ideas and concepts that may alter the path you had so carefully planned. Take the chance to be yourself.